More often than not, I simply pine after a book and never take the plunge and acquire a copy. Today's email alerted me that Christie's identified 6 lots which might interest me from the auction, Importants Livres Anciens, Livres d'Artistes et Manuscrits, May 11, 2011. Actually, there were many more lots in this auction that I am interested in but I restrained myself when initially registering with Christie's, keeping my interests on the short side! As I was browsing through the list of 6 lots, my attention turned to Lot 0214, [PICASSO] -- KAHNWEILER, Daniel Henry (1884-1979). Les Sculptures de Picasso. Photographies de Brassaï. Paris: Éditions du chêne, janvier 1949. In-4 (310 x 234 mm). 218 photographies en héliogravure d'après les originales de Brassaï et de Dora Maar. Cartonnage original de l'éditeur, plat supérieur orné d'un moulage de la main de Picasso, dos en toile noire (petites égratignures). ÉDITION ORIGINALE. Très belle publication sur les sculptures de Picasso, luxueusement imprimée. Très bon exemplaire avec la reliure en bon état de conservation. After an annoying email verification and required telephone number entry, I accessed the condition report which states: "Lavishly illustrated documentation with gravure plates after Brassaï and Dora Maar. Original cloth-backed decorated boards in good condition (only a few scratches)." There were no photographs of the book available and the estimated selling price was listed as $292-$439. Assuming shipping and applicable buyer's premium I imagine the complete cost to acquire this copy would be between $400 and $600. I'm not planning to bid but I did decide to do a little research on this Picasso-Brassaï collaboration. Here is a listing of 4 other copies currently for sale listed between $125 (very very very tempting) and $279 plus shipping. Brassaï photographed Picasso's sculpture between 1932 and by 1946. They developed not only a close professional relationship between artist and photographer but also a close friendship. 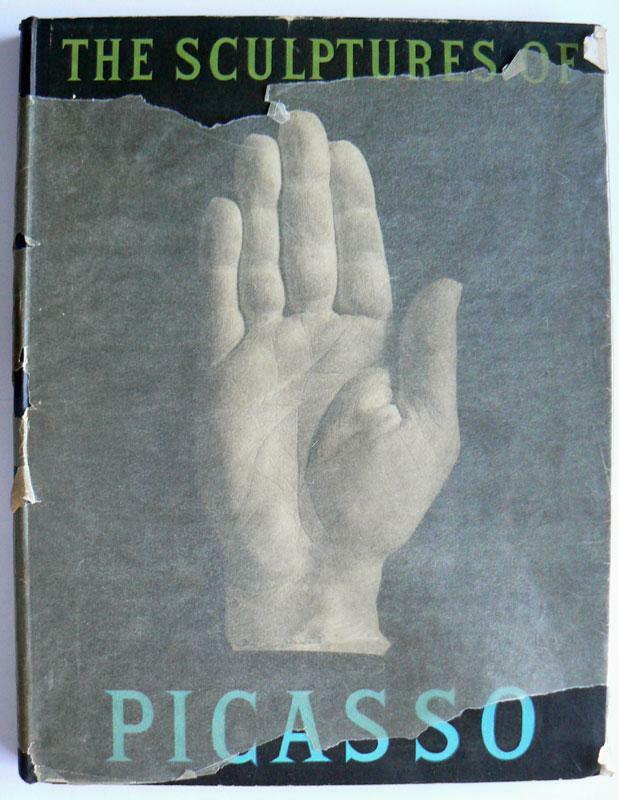 Daniel Henry Kahnweiler was Picasso's art dealer and wrote the text accompanying this book. Dora Maar, a favored muse, lover and ultimately, tragic figure from Picasso's life, was a trained artist who ventured into photography during the 1930's and contributed photos to this collection. I would certainly love to add Les Sculptures de Picasso. Photographies de Brassaï. Paris: Éditions du chêne, janvier 1949 but I wonder about the projected cost of this particular edition and what other editions of this work might be more appropriate for me, one who can not read French. 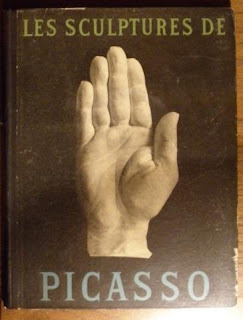 The first English edition of Les Sculptures de Picasso. 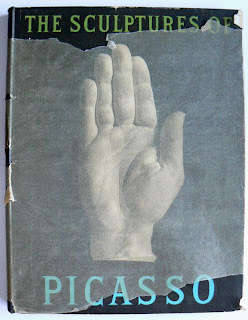 Photographies de Brassaï, translated from the French by A. C. B. Sylvester, published by Rodney Phillips, London, 1949 (printed in Paris, France, by Theo Brugiere) with the title The Sculptures of Picasso is a more likely candidate for my library. I would like to actually read Kahnweiler's essay so this seems a better fit. It is interesting to note that the Éditions du chêne and Rodney Phillips editions were both published in 1949 and is a potential source of confusion concerning which edition appeared first, in this case the French. There are 9 copies listed for sale. A few copies are ex-library and probably in poor condition. I personally don't think there is any need to pay a premium for a copy which includes the original tissue wrapper. Recently, Assouline, New York, published a new edition with the title The Sculptures of Picasso, by Daniel-Henry Kahnweiler, Photography by Brassai, Portfolio format with loose photo prints, 2005, $120, direct from the publisher. I am disappointed with the web page from Assouline because there is no mention of Dora Maar or if this is a new translation of Kahnweiler's text. I expect that it is the original English translation and the Dora Maar photographs are included and both should be mentioned on the catalog page for the book! At any rate, I would expect that the publication is high quality and for anyone interested in a complete collection of this work, a necessary acquisition. Copies are available on the secondary marketplace priced between $61 and $139 plus shipping, but since the publisher still has copies for sale, I'd prefer a brand-spanking new, copy! This is a simple illustration of the basic and quick research that will help a collector or innocent book junkie avoid overpaying for a want via auction. Always do the research if only to make an inquiry with the auction house prior to bidding. Verify, comparison shop, comparison price and then, only if the price is right, make a bid. Even though they take the excellent tasks and tasks, they never recommended broadcasting it which is the best issue about these providers.